These chokes are usually based on alloy powder cores with Sendust material. 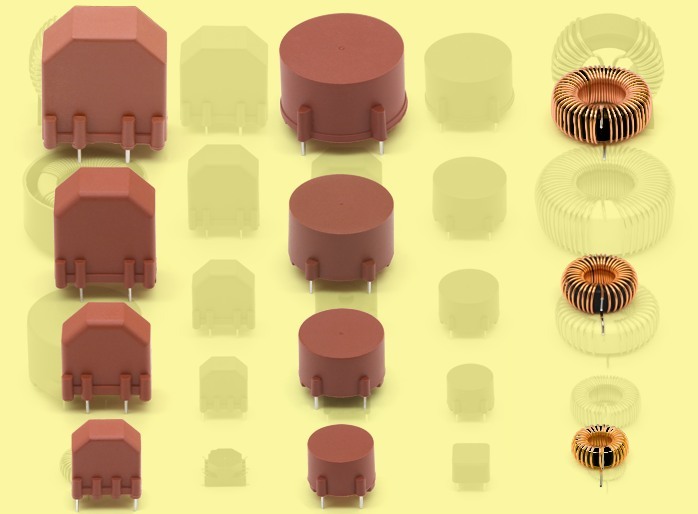 They have only slightly larger inductance dependence on DC magnetization when compared to the iron powder cores. However their main advantages are much better frequency properties, which predestined them to use the as switch-source chokes to frequency at least 100 kHz. Standard simple chokes of series PMEC 321 to 324 are designed as a direct replacement of iron powder simple chokes of series PMEC 221 to 224. Most of our Sendust chokes are usually produced according to customer requirements, thus tailor its application. Draw of /Ve, /Ver, /Vi, /Vir, /H and /Hr model from below. 1) Approximate diameter of core without winding. 2) Measured at 10 kHz, 50 mV and 25 °C. All measurements comply with the requirements of EN 60938-1 (VDE 0565 part 2).